My son’s ‘best friend Charlie’ recently celebrated his 3rd birthday and there were a couple of reasons it was proving difficult for his Mum to make him a birthday cake. Firstly, their home is undergoing major renovations which have meant they are living in a not-so-conducive-to-baking place at present. Also, Charlie has several allergies including eggs and dairy products. As we were having a little party for him, I offered to make a cake and set off on a quest to find a dairy-free and egg-free option that hopefully tasted good (I’ve been told that many in the past definitely failed the taste test). I have a great recipe for Vanilla Birthday Cake, but this was going to be a new challenge. 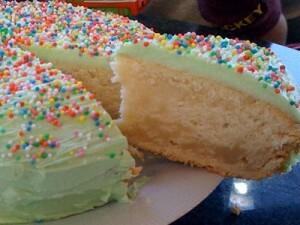 The Egg and Dairy Free Vanilla Cake recipe below is what resulted and it proved to be a winner all round – none of the kids noticed any difference and ate it up (so did the Mums). Although the texture was a bit denser than normal, the flavor was great. Just ask Charlie who was delighted to finally have a chance to eat as much cake as he was allowed…and then some more the next day! Preheat oven to 180C (360F). Grease a deep 20cm round cake pan and line the base with baking paper. Beat the 2 tablespoons of water, oil and 1 ½ teaspoons of baking powder together with an electric mixer for about 30 seconds or until well combined. Add the remaining ingredients and mix on low speed until combined. Increase speed to medium and beat for about 3 minutes until mixture is smooth and thick. Pour mixture into prepared pan. Bake in the oven for 1 ¼ hours, or until a skewer inserted into the middle of the cake comes clean. Stand cake in the pan for 5 minutes then turn onto a wire rack to cool. To make the icing: Place softened margarine and icing sugar into a bowl and combine well. This can be done by hand or with an electric mixer. Beat in the water, vanilla and food colouring if using. Spread the icing onto the cooled cake and decorate as desired. If you have any questions or comments about this recipe, please feel free to leave them below. that looks such a beautiful birthday cake. Thanks for sharing. I can make this cake for any of my friends who are allergic to eggs and dairy. You’re so sweet..my husband would love this, he’s mildy allergic to eggs. Happy Birthday to your son’s best friend Charlie! How nice of you to make such a great cake for your son’s best friend! I love the sprinkles you use to decorate the cake. Great idea Carla! I’ll be trying that too. Thanks for sharing the idea. Do you use the same baking temperature and time for cupcakes? I mixed the batter as directed, distributed into 12 cup muffin tin with cupcake liners, baked then at 350F for 30 minutes, they are beautiful! Thank you so much for this recipe. Hi Ashley, I’m so glad they worked out. I was going to suggest using a similar temperature but reducing the cooking time – sounds like that was the right way to go.